Item Number: 266-2-71 17864 Actual Weight: 1.5 lbs. Low-pressure, extra-soft foam for comfort and fit. Shaped to fit even very small ear canals. Independently tested to ANSI S3.19-1974. Noise Reduction Rating, NRR 33. 100% PVC-free. Dispenser box contains 100 pairs of individually wrapped corded earplugs. Each package features randomly colored earplugs. 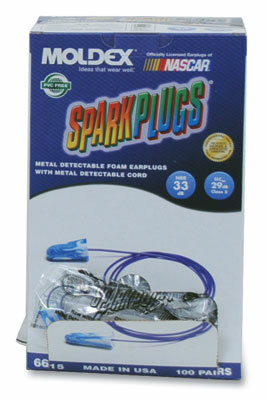 The corded style has an enclosed metal ball bearing so that the earplugs remain detectable even if the cord is removed.